Sometimes you just get tired of plain old water and want something that not only quenches your thirst but wakes up your taste buds. When that happens, turn to these easy, healthy, and refreshing recipes. Nothing helps me unwind more than a relaxing bath with calming lavender oil. But when it is hot, I prefer to drink these soothing oils and not soak in them. This lemonade is a great choice if you have transitioned from the Basic Plan from my book, The Blood Sugar Solution and tolerate a little sweetener from time to time. Cool the lavender mixture in the refrigerator for 2 hours to bring out deeper lavender flavors. 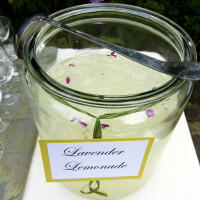 Strain the liquid into a pitcher and discard the lavender. Add the lemon juice and stir to combine. Store in refrigerator for a few days but best enjoyed fresh and chilled.